Built for racing & winning! This boat won the Trans Agulhas race–biggest SLT (Super Light Tunnel) endurance race in the world–the past two years in a row! Being of very light weight, it can be easily carried by two people and can be launched & recovered by 1 person. 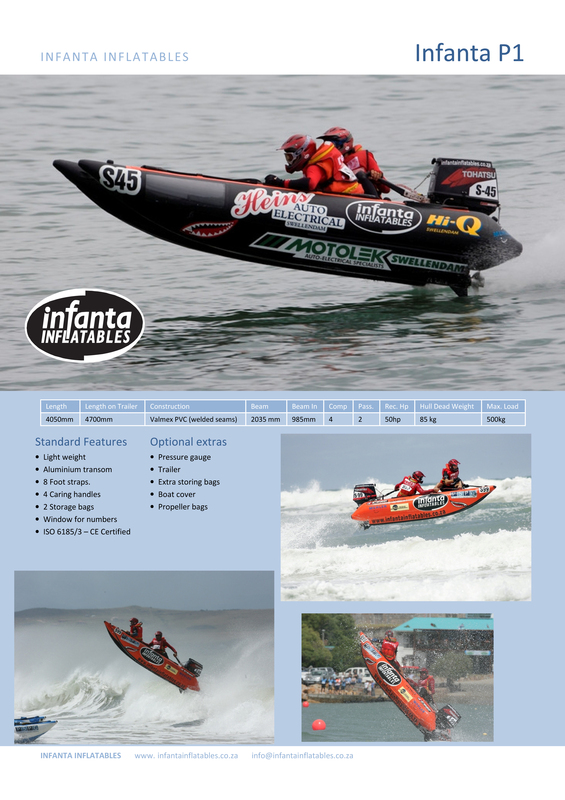 Contact us at Inflatableboatracing@gmail.com to order your boat now! These hulls are very similar with slight differences in the manufacturing process and dimensions. This being said, the Infanta has been a very popular boat and has won numerous titles on the international circuit. There are numerous factors to consider when we talk about the “fastest hull” i.g weight in the boat, setup height of the engine, angle of attack, the prop itself (which plays a very big part in this discussion), the water conditions, etc. And then the obvious – the skill of the pilot! Having said this, both hulls are very fast and the difference in speed will depend on the pilot, weight and setup. Which boat is better made (lasts longer). Don’t intend to race. I’ve owned two (Xtreme & Thunderduck). Needs to bear the heat of Florida. Will power with 50 HP Tohatsu. Thanks!! Gemini, Infanta and Ceasar are all very good boats. It really comes down to personal preference and how well you take care of your boat against the elements. The material which these boats are built with will certainly play a huge roll in the longevity of your boat and it is very important to make sure that you know where the material has been sourced and the grade of the material. Thirdly, craftmanship is also very important.